A wedding means different things to different people: love, commitment, celebration. However, for Diane and Michelle Sutton of Ohio, their wedding meant so much more. 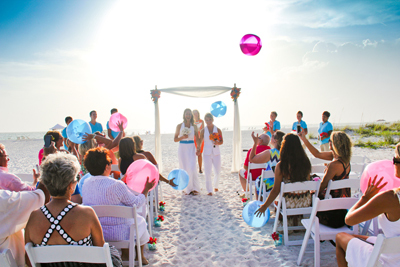 This unique celebration, which took place on the sunny shores of one of Florida’s most stunning beaches, was also a representation of the kind of courage that two people can give each other when they are in love and decide to face the world together. Diane and Michelle chose the fantastic backdrop of Tortuga Inn for their wedding, which took place on June 23d, 2014. Tortuga Inn is located on Anna Maria Island, which is known as one of Florida’s best-kept secrets with its sparkling white sands and unparalleled ocean vistas. As the guests arrived, they were treated to an amazing view of the simple yet elegant arch set up on the beach’s pristine sand. This arch, which was white and accented with orange and blue tropical flowers, would be where Diane and Michelle would exchange their vows while the guests bore witness from comfortable white beach chairs. Before the ceremony, Diane and Michelle shared some intimate moments together. Beautiful gifts were exchanged, including diamond earrings and pendants that each of the women donned for the ceremony. Some fun and fanciful photos were taken before the ceremony began, with the women posing both alone and together with bright bouquets of tropical flowers and seashells. Once the photos were finished, it was time for the ceremony to begin. Before Diane and Michelle made their grand entrance, their wedding party, all dressed in turquoise shirts and khaki shorts, came before them in a wedding parade. The scene was both endearing and whimsical as the brides came down the wooden ramp from the inn, hand in hand and dressed in their white wedding attire, their feet bare for the beach ceremony. 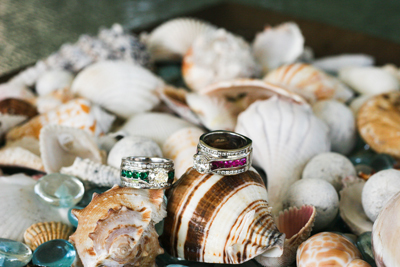 The women exchanged sparkling platinum rings encrusted with emerald and tourmaline gems as their friends and family looked on. The ocean backdrop and gentle breezes of salt sea air gave the ceremony an aura of peace and harmony that was evident to everyone who attended. Once the ceremony was over and the rings were exchanged, the sparking white sands of the beach made the perfect backdrop for more wedding photos. The brides posed with their wedding party, friends, and family, and there were a few touching moments as some photos were taken with memorial pendants of those who had passed on before the wedding, but these photos, which were taken with the bride’s wedding bouquet of blue, pink, and orange tropical flowers, allowed Michelle and Diane to remember that their loved ones were there in spirit. The brides also posed with a hand-held chalkboard that said “Thank You!” as a way to express their gratitude to their guests. There was also an element of fun to many of the brides’ photos. As the sun began to set and lit the water with light, Michelle and Diane made amusing hand signs and carried each other around on the sand as they laughed together. The backdrop of the ocean, the white sand, and the setting sun was the perfect complement to these moments that the two women shared together. Once the post-ceremony beach wedding photos were taken, it was time for the reception, which was beach-themed with personalized bottle cozies to commemorate the occasion, pink glow stick bracelets, and beach balls that rained down throughout the evening. There was also a photo album that Diane and Michelle had put together for the guests to sign as a keepsake once the wedding was over. As the sun went down and the evening breeze wafted throughout the open-air reception hall, the guests enjoyed cocktails and music as the brides spent time with everyone who attended. Diane and Michelle opened the reception with their first dance as partners, and laughed openly as they did so. For two women who’d had a difficult time finding vendors for their ceremony, the Tortuga Inn and this beautiful beach proved to be everything they had ever dreamed of, and so much more. Summary: Diane and Michelle Sutton’s wedding celebration took place on the sunny shores of one of Florida’s most stunning beaches and was also a representation of the kind of courage that two people can give each other when they are in love and decide to face the world together.